The Celtic Altburg Fortress was constructed around the year 300 B.C. It was populated until the time of the Gallic Wars (58-50 B.C. ), which ended with the defeat of the combined Celtic tribes and the Roman conquest of all of Gaul, including Hunsrück. Altburg is a typical Celtic fortress from the Late Latène Age (500-20 B.C. ), lying upon a rocky peak, approximately 20,000 m² high above the deeply cut Hahnenbach creek, whose waters make a tight bend here. A fortified wall with a trench at the front protected the actual castle and the houses surrounding it. Altburg served as a small centre and place of trade for the farming communities in the area. This is supported by the large number of archaeological finds here, beneath which were Etruscan wine amphorae from the Mediterranean region. During the archaeological excavations carried out between 1971-1975 almost the entire interior of Altburg was investigated right down to the bedrock. In the process, detailed traces of the settlement were found. About 3,600 post holes, palisades, fence trenches, as well as a cellar hewn in the rock, gave detailed information about the grounds which had been rebuilt several times. Based on these traces a (small) part of the original layout has been reconstructed as the focus of an open-air museum. This includes five residential buildings and five granaries built upon stilts as protection against pests and moisture. 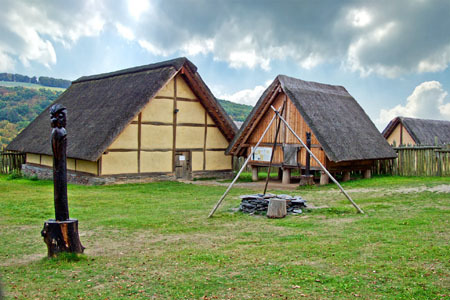 They allow you to study the Celtic construction quite well: the upright-posts, wedged into the ground and braced above, served as wall frameworks for the residential buildings and carried the roofs, which were presumably covered with wood shingles and straw. The walls, woven together and then plastered with mud, left the square-trimmed framework exposed. The interior, with no intermediate floors, was open to the ceiling. With the door as the only opening, an open fireplace upon an earthen floor, and modest furnishings, such buildings were basic for the extended families of that time. From the gate of the fortress a relatively wide path led up the side of the mountain to the peak of the rocky plateau. Here walls divided the interior of the fortress into various sections. The upper fortress (Oberburg) included a special rock cellar and suggests the generous building style of the ruling lord of the fortress was a local prince descended from the tribe of Treverians. By contrast, the lower fortress (Unterburg) was much more cramped, with a network of narrow lanes and a central square. Altburg should not be seen as an isolated location, for it was certainly in active contact with neighbouring Celtic fortresses (Schlossberg near Dhaun, Wildenburg near Kempfeld, and Ringskopf near Allenbach are all within 8 to 15 km) connected by a network of roads. Today, the "Sirona" nature trail connects the Celtic settlements on the heights and the system of ring walls. Furthermore, it also makes the Roman cultural memorials of the region accessible. The Sirona Trail was named in honour of the Celtic Goddess Sirona, the goddess of healing springs and the stars in the heavens. A well preserved statue of Sirona has been found in an ancient sanctuary at the foot of Idarkopf mountain. The special topography of Hahnenbach Valley near Altburg was utilized during the Middle Ages when building the well secured Schmidtburg Castle (here the very narrow and deeply cut valley is bordered by steep, rocky sides). It is one of the oldest castles in Hunsrück (constructed around the year 926) and was enlarged to its present size by the Trier Archbishop Balduin of Luxemburg (1307-1354). Due to its remote location, it once served Schinderhannes as a hideout. Near the Altburg open-air museum is the Herrenberg slate quarry with its rich collection of fossils in Hunsrück slate from the Devonian period, 350 to 405 million years ago. In the stone slabs of this quarry are the world-famous fossils of the Bundenbach Slate, including sea lilies, starfish and jelly fish, whose soft parts have partially been preserved in fossilized form. Collectively, more than 60 different varieties of plant life and 240 different kinds of animal life from the Devonian Period have been discovered in the Bundenbach slate.